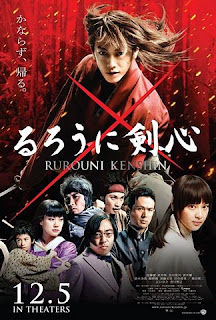 The popular manga written by Nobuhiro Watsuki about an assassin-turned-wanderer samurai came to life as a live action movie last 2012 and stopped the hearts of its manga and anime enthusiast not just in Japan but around the globe with its entire wonderful samurai clashing fight scenes and gorgeous cast. The story revolves around the life of Himura Kenshin, a kind heart wanderer samurai who offers protection for people in need or trouble with his reverse-blade katana which could injure a person, not to kill. His past occupation as an assassin ended in Bakumatsu war when he decided not to kill with a sword anymore. One day, he met Kamiya Kaoru, a lovely lady who is in charge of the Kameya Kashin dojo and later had a deep friendship with her due to her acceptance in spite of his dark past. What can I say about the movie? Well, the movie reached the hearts of its viewers not just because of the story’s popularity as a manga and anime but because of the justified casting of its characters’. Takeruh Satoh was definitely the best for the role due to his resemblance to the anime character and terse moves when fighting with a samurai. While Emi Takei as Kamiya Kaoru produced such very feminine but brave-hearted young lady perfect for the character. I also like Munetaka Aori though I expect Sano to be a drop-dead muscle sculpted man, anyways, it was still good. The settings of scenes were rich that it really gives color and feel of the Meiji Era. I love those brown-leaves places and the war scene at the start; you can absorb the feel of those scenes. Also, students would then be amazed of one Japan’s culture and the samurai would top that. Looks like a nice Manga adaptation movie. I'm sure the followers of the original series would follow this.